I Got a Flat! What’s Next? Flat tires are dangerous and intimidating. 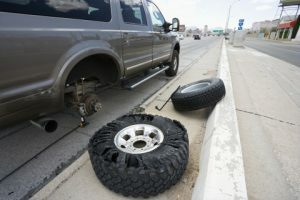 Whether you’ve changed a tire or not, going through the motions of experiencing your tire blow while driving on the road is something we hope you never have to experience. But, there is a chance you will have to change a flat tire at least once in your life. So, what do you need to know? What should you do if you get a flat tire? If you’re lucky, you’ll experience a slow leaking tire and wake up in the morning and head out the door only to realize your car has a flat tire. Unfortunately, if you are driving and experience a tire flattened from debris on the road, you’ll feel your car sag to the ground as well as a hearing “thud, thud, thud” every time the tire turns over. Immediately pull over and inspect the tire. Go ahead and gently run your hand along the tire to feel for a foreign object, if you don’t find anything, such as a nail, or industrial staple in the sidewall or tread of your tire, your tire may only be low on air. While out on the road, it’s best not to patch the tire yourself. It’s time to learn how to change a tire. If you’re unsure on how to do so, stay tuned for our next blog: How To Change a Flat Tire. To continue, you’ll change the tire, even if you think it’s just low on air. Once you’ve successfully change your car’s tire, it’s time to bring your car to Urban Autocare. We can assess the damage to your tire and car. Give us a call today to learn more. We’re Denver’s premier auto repair specialists and are ready to provide any repair you need, tire, body or interior related!